Since I really like the little capped sleeves on the Bubble dress I paired it with another Oliver + S dress I really like; the Fairy Tale dress. Laying the bodice section of the Fairy Tale dress over the bodice section of the Bubble dress, I traced out a new pattern piece. The skirt is the pattern pieces from the Fairy Tale dress. To assemble the bodice section, I followed the instructions for the Bubble dress stitching the neck and sleeve outer fabric and lining together (after the collar was basted in place, of course) and then switched to the instructions for the Fairy Tale dress. Getting the zipper in was a bit tricky but with patience, worked out just fine. I made a matching hair band using ribbons and a random button. The Bubble dress bodice works well with features of the Fairy Tale dress and I really like it with the Peter Pan collar. For the hem, I turned it under half the amount that was called for on the pattern, ironed it well and then turned it under the same distance again, and ironed that well too. Then I stitched about 3cm (1 inch) up from the bottom edge of the last fold creating a little tuck. Finally, I turned that last hem fold down and ironed the whole dress. The hem was now neatly tucked away. 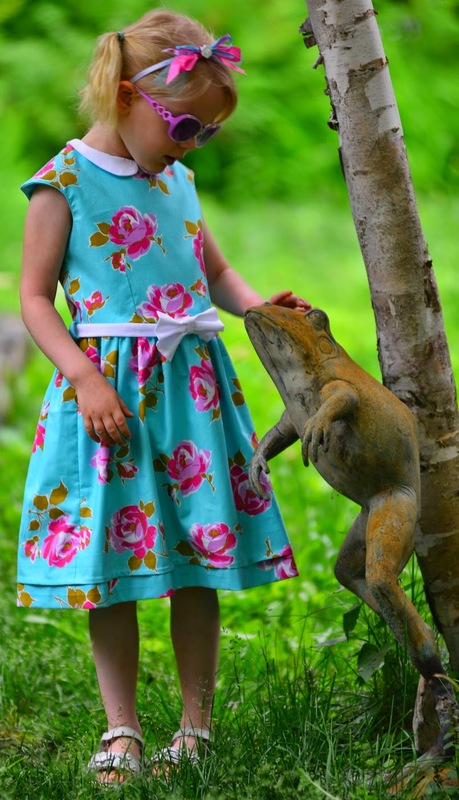 Miss C loves her new dress and the froggy too. Clever Deb - looks so good together. Love the fabric - and the accessorising! Love this combo. You have been busy Deb!! It is so gorgeous!!!! I love everything about it! Deb, I LOVE this version! 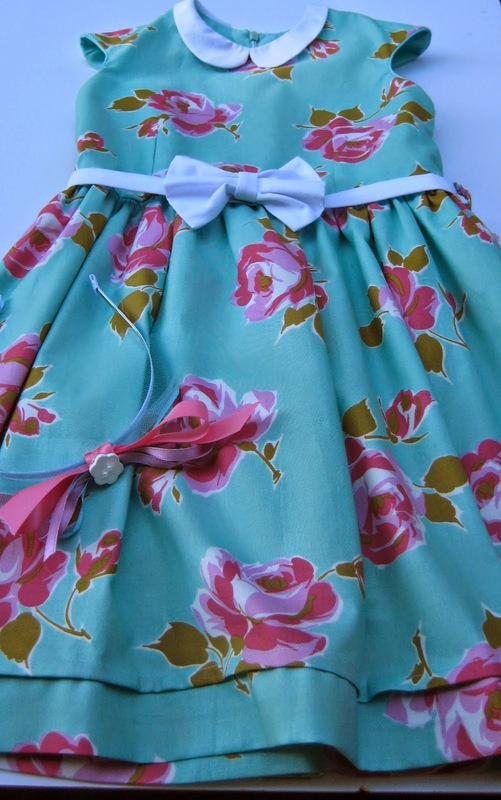 The white collar and belt/bow pop against the pretty print.